Home / ENTERTAINMENT / VIDEO: Remember When Facebook founder Mark Zuckerberg said he crashed a Hip Hop music video in Nigeria? VIDEO: Remember When Facebook founder Mark Zuckerberg said he crashed a Hip Hop music video in Nigeria? 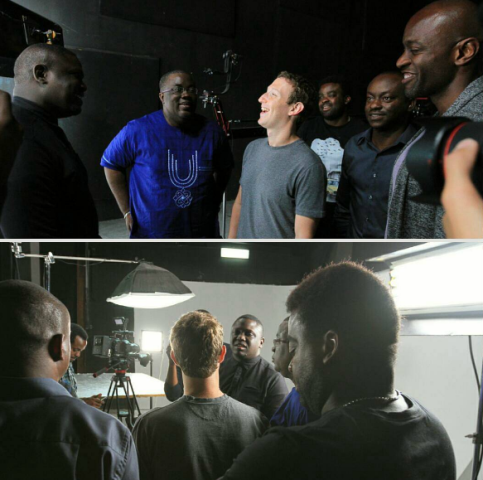 Facebook Founder and CEO Mark Zuckerberg revealed on August 31 that while he was in Nigeria, he crashed a hip hop music video and met some of Nigeria's biggest stars. A video has now been released and it shows Mark meeting surprised 'retired' Nigerian rapper/hip-hop recording artiste, Tobechukwu Melvin Ejiofor aka Illbliss. The rapper was shooting a video for a single at the Afrinolly studios when Mark Zuckerberg, who was on a tour of the facility, walked in. The video shoot was paused as Illbliss introduced himself to him and asked if he was enjoying Nigeria. Mark apologized for the interruption, which Illbliss described as an amazing one, and they continued talking with one another.